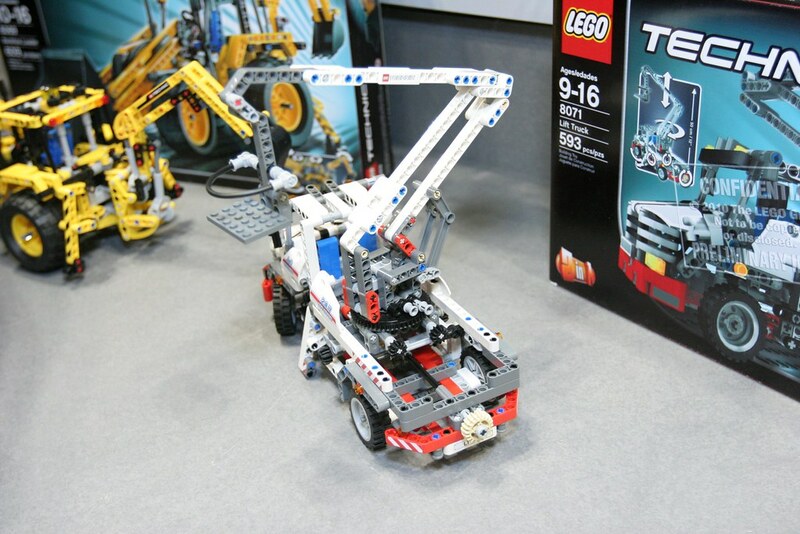 Photos and videos with many of the new 2011 LEGO sets, taken at New York Toy Fair 2011, have been around via the fbtb Flickr photostream. 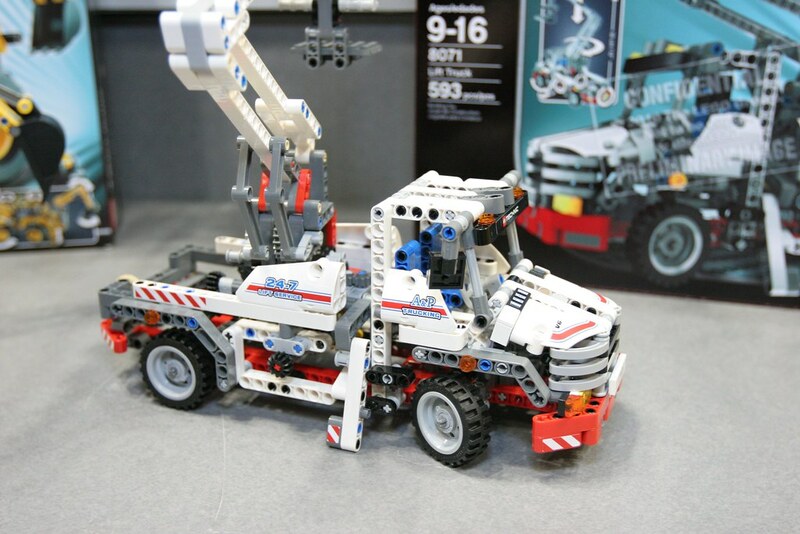 And this was the opportunity to see the 8071, Bucket Truck (or Lift Truck, as written in the box) more in detail. Unfortunately no new images nor a video from the 8110, Unimog U400 (was hoping for an opportunity to see a shot from the bottom side). Also the 8081, Extreme Cruiser remains the Technic secret of the season. As seen from the box mock-up, this is a 593 part set with predominance of with white Technic beams and panels (not so common color, among LEGO Technic sets). Steering control, from the 20t double bevel at the back. Two black 12t gears near the turntable, for lift arm rotation and raising movement. Another two black 12 double bevel gears (one at each side), to adjust the respective outriggers. The stickers with "A&P Trucking", may be an hint for a set designed by Alfred Pedersen!? As usually, the more we have opportunity to see new images from a set, it tends to become more and more interesting. Finally, this set price tags for the North American markets, are $49,99 USD or $64,99 CAD and it will become available in August as expected. Now probably the least expected, but somehow anticipated in a previous Poll. 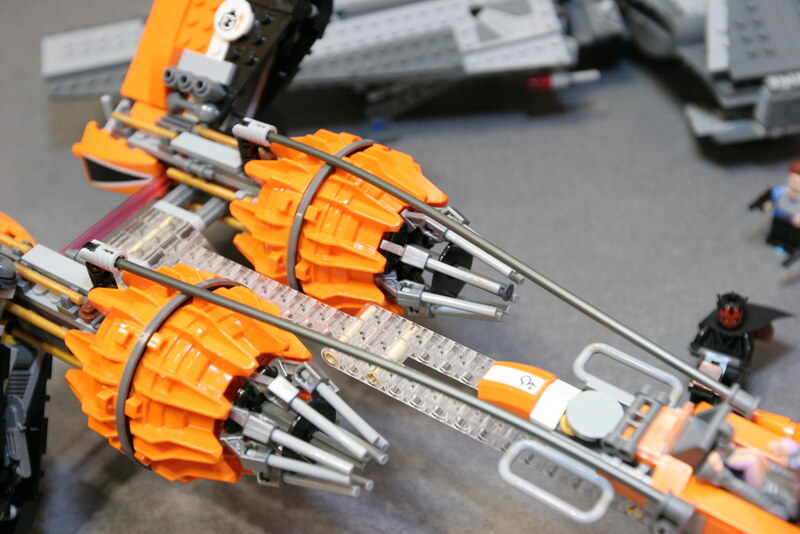 LEGO Technic Fans (or FOLTs, as Alexandre would call them) want more parts in new colors. And it happens that the Trans-Clear beams are also among the most wanted. These are probably quite interesting to build discrete supports for some models, or to allow visibility on something left behind. 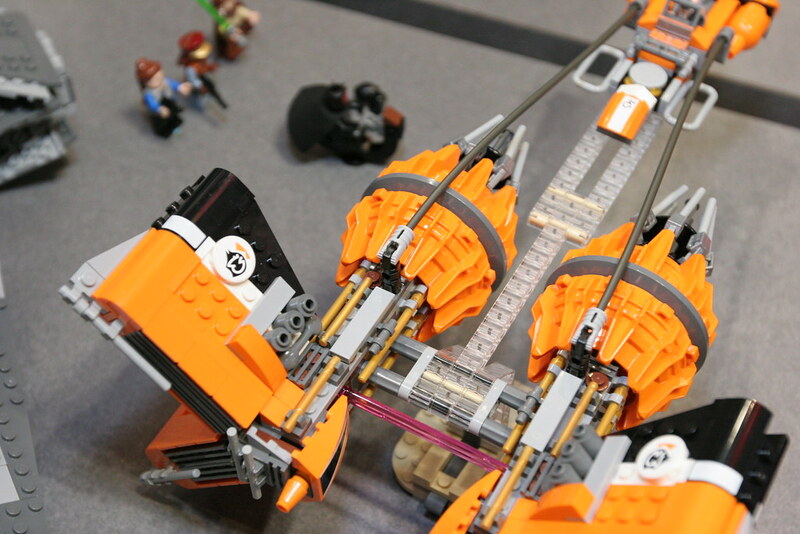 They have shown up, not into a LEGO Technic set, but a LEGO Star Wars one (7962, Anakin's and Sebulba's Podracers). I'd say, almost irrelevant where they came from, provided that we finally got these also in the parts assortment. 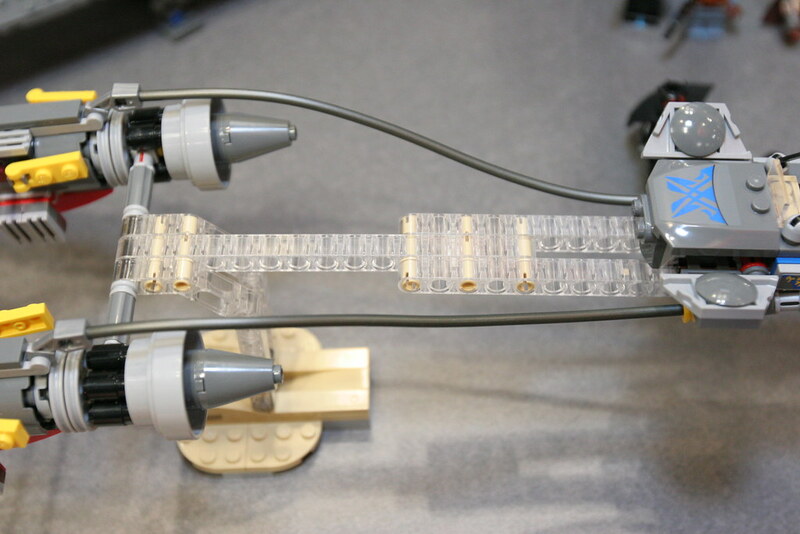 See the new Trans-Clear 1x15 Thick Technic Beam (32278), and 1 x 11,5 Double Bent Thick Liftarm (32009), in several photos from this new SW set. Where will you make use of them? It seems to me the bonnet and doors are fixed on a single side, which suggests they can be opened. Speaking of the former, by looking at the rear wheels I doubt there is a piston engine under it. As for the transparent beams: to me the most immediate application (there aren't too many Technic flying machines that would benefit from a stand) would be for really large headlights. PF lights shining on those will probably look quite cool! I also don't think there will be a piston engine under the hood, as it is not common at these scale Technic trucks. Yeah, an engine is impossible at this scale (moreover, we do not see diff on the rear axle, and the front axle already have the steering mechanism). 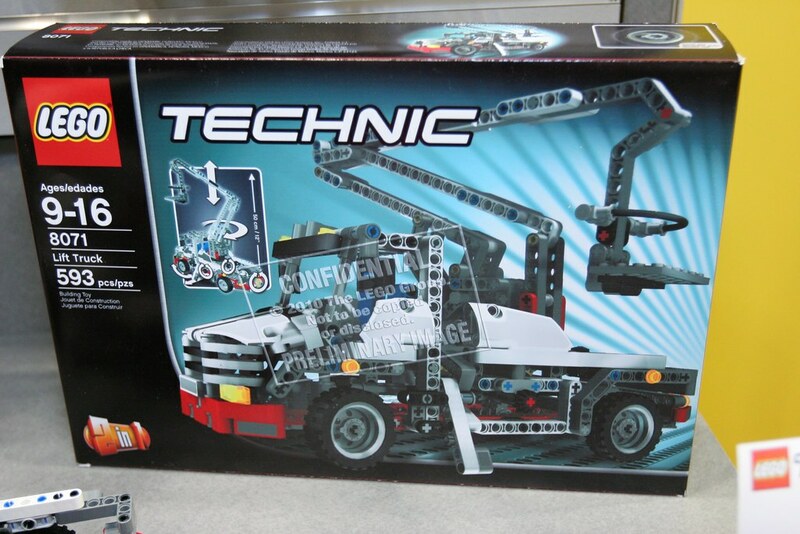 The best we can expect is some "mechanical" parts like on the set 8264. But I tend to disagree with what is written in the article. IMO, the 2 black 12t near the turntable are for the outriggers (one for each outrigger). The others 12t located on the sides of the truck may be used for rotating and rising the arm. Eventually, I do not think this model will be motorisable with 8293. A motorisation would make sens only if (at least) rotating and rising the arm were motorised. So, since there is no gearbox, it would require 2 motors. Which is very unlikely to happen. When I wrote "motorisation", I meant "fan-made motorisation": making the model remote-controlled like what was done with the 8294 Excavator, 8265 Front Loader and 8264 Hauler. ;) I too doubt the Bucket Truck is officially motorisable. However, size itself is not a limitation for cylinder engines: the 8296 Dune Buggy B-model is quite small and still has room for an L2 (is this the correct nomenclature?) engine. In the Truck's case, it's probably either a case of lower price or difficulty of passing an extra axle from the rear wheels to the front. I want so bad to see extreme cruiser! I think the lack of an engine (well, as assumed) is simply a lack of room under the hood. You would fit a 2 cylinder in there at best. Today i tried to make an order for some extra "8051" wheels and tyres. The were "not available for parts sale"
Then the extreme cruiser might very well be an bike? I don't see a direct relation. Also as these wheels are being used at several sets currently in production, they should be available for ordering, unless they're classified as Q-elements for some reason that I cannot imagine. Most likely there is some temporary shortage in supply, and thus you can't order them. Lego would have *lots* of them in production! It's a great idea using parts from other themes... yes, they could have come up with a new 'space wing' mold... but these panels work quite well.. I'm sure keeping costs down for TLG.. In fact, I'd be pretty sure that when a new piece is proposed, it'd be shown to all the departments, to see if other themes would have a use for it. These photos are in very high quality, so reverse engineering is posible. I started yesterday and have the truck finished. In the next two days I will make the arm and bucket. I ordered some part, like the panels, the 13L liftarms in very light bluish gray (they don't exsist at the moment) and the parts to make the grill. Then I get all the parts in I can make everything in the right colour and will mak photos an a video of the working stuff. There is no piston engine in it, doors and hood can be opend. The outriggers are controled by the black bevel gear behind the crane (turn table). Steering is controled by the tan 20t bevel gear. rotation of the crane/arm is done by the right black bevel gear and lifting the crane/arm on the left side. The steering is weird. Between the steering hub and the wheel, there is a space of 1 stud, which makes the turning of the wheels huges. This is probably done because of the parts needed for the second model. I can confirm that when a designer wants a new part it is passed along to the different design labs to see if it could fit in other sets. If for some reason it doesn't it becomes very hard to get the part to be produced. An additional advantage of this process is that modifications can be proposed to make the part more universal and usable in more different situations. Of course there are exceptions to every rule, especially in the case of Technic parts which are often quite specific for Technic... and MINDSTORMS. I don't think the white colour scheme was because of excess SP panels. 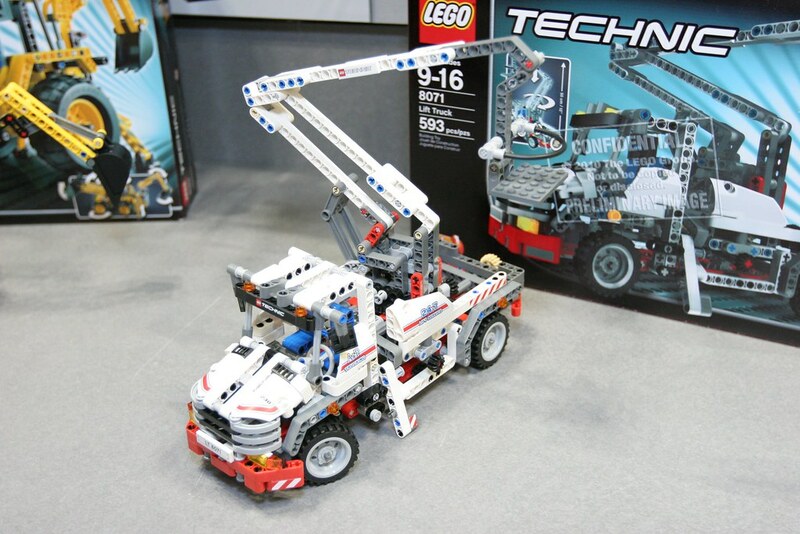 Do a quick Google image search for "bucket truck" and most that come up are white.